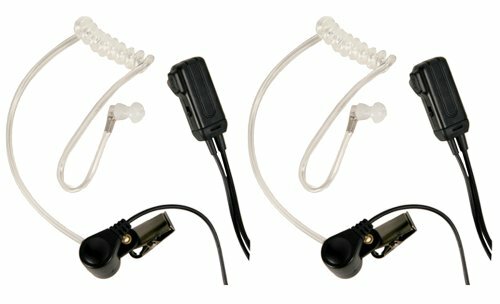 The Midland AVPH3 Transparent Security Headsets with PTT/VOX are ideal for those in the security industry or for hunters. A transparent behind-the-ear microphone fits directly into the ear. It includes both a push to talk and vox option. The pair of headsets work with all Midland GMRS/FRS radios. Two ear microphones and two push-to-talk buttons. PERFECT option for loud events! Worse than the ones that came with the radio! I got these to replace the headset that came with the radio, so that we could better communicate while riding our motorcycles. We tried them out in the house and immediately put them back in the box. They were uncomfortable for me to wear (though my partner didn't seem to mind) and the clarity was terrible. The description doesn't tell you that the mic is actually on the same piece as the PTT button, and unless you are holding it in just the right place when you talk all you get on the other end is whisper on open air. I bought them on the strength of the reviewer who claimed to take them on ATV's but on our motorcycles we use full face helmets, no way could we use these. Comfy to wear. The mic is weakest part of the is setup, frustratingly so. It's my first ear and mic set up like this so I can't offer a comparison. It blows away the boom set up included with radios, but I would look around for something with great reviews, I had limited time and it did the job.